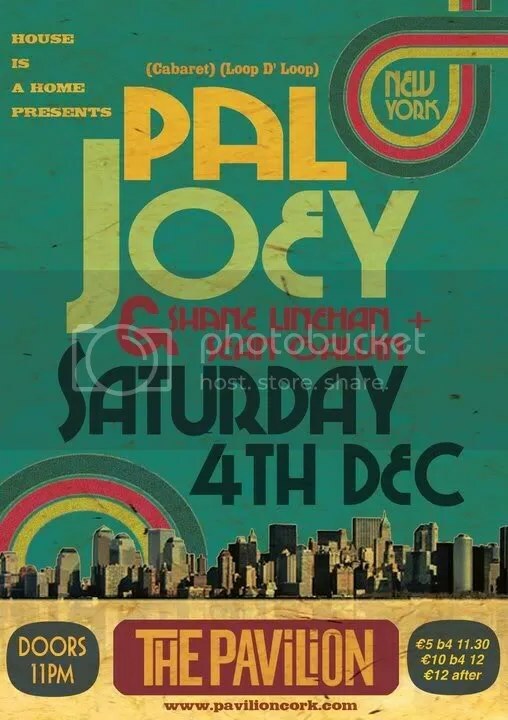 More Cork news: one of the city’s club nights, House is a Home, is bringing the esteemed house DJ Pal Joey to the Pavilion venue on December 4th. Sean Galvin and Shane Linehan, who run House is a Home, are two serious record collectors and DJs who are well known in the Cork scene, and they’re clearly determined to bring great house music and producers to the city. Working at Vinylmania, where Larry Levan might be found shopping for records in his pyjamas, helped Joey’s entrance into the city’s nascent house music scene, and he was soon working with everyone from KRS-One to Sade to the Orb. True to his city’s inclusive spirit, Pal Joey consistently blurs the lines between disco, house and hip-hop. Pal Joey has released records on respected labels such as Jive, Epic, Talkin’ Loud, Wave and Coco Machete – but he also has three labels of his own: Loop D’Loop, Cabaret and Footstompin’ Records. Door price is €5 before 11.30, €10 before 12 and €12 after 12. Visit www.paljoeymusic.com for more information and music or say hello to him on Twitter.